Vecto: Vengeance is the first book in a trilogy that I'm writing. You can buy the first book on Amazon, Barnes & Noble, Apple, etc. 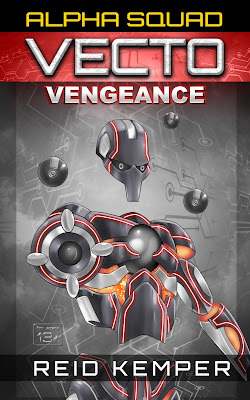 The link to the Amazon page is here: Vecto: Vengeance. I'm posting chapters for free on Wattpad.com, but they're not the final versions. You can visit my Wattpad page at wattpad.com/ReidKemper, and make sure to leave a comment and vote for the story. I'd love to hear your opinion! The book stars a character that I created in 1996 named Vecto--a robot made of floating parts who has emotions. I created him for a collaborative universe I helped start called the Alpha Squad. The stories have always been something my friends and I enjoyed creating, and I'd like to share that universe with you. In the storyline, Vecto was created in the year 3,005 by a scientist named Vic who is part of a midget race of beings called Dinishmen (the race is small and frail because they are optimized for brain power with less resources provided to their bodily form). 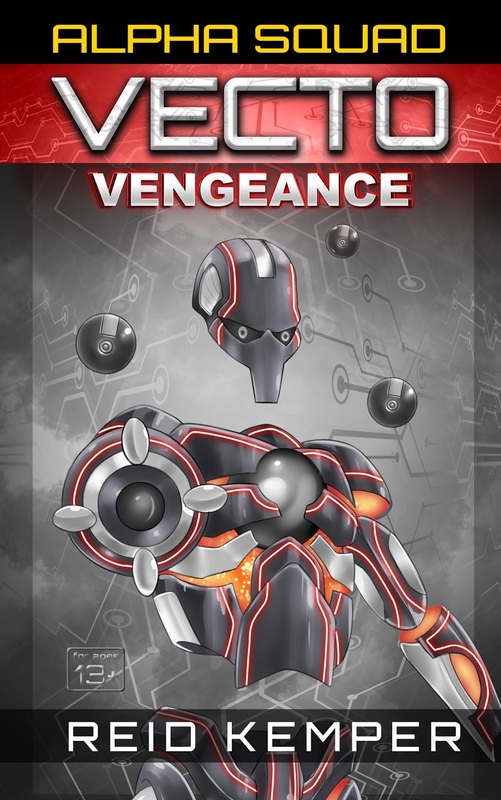 His being consists of an orb that projects layers of form-fitting shields around a body of floating parts. Although he helps fight in a war, he is eventually disowned by his master and is recruited by a group of fighters called the Alpha Squad. The A.S. was created with the sole mission of eliminating a nine-foot-tall cyborg called Morphaal, who is considered the most dangerous being alive. Years later, Morphaal is killed and the Alpha Squad no longer has a purpose. Even after Morphaal's death, his henchmen live on and Vecto's best friend is killed. The Vecto book starts off with Vecto trying to deal with his friend's death. To top it off, he hears that Morphaal has been revived and is looking to conquer a hidden planet called Zendora, where Morphaal plans to move his base of operations. The story chronicles Vecto's quest to find Morphaal. However, the loss of his friend causes him to obsess over finding Morphaal to exact revenge. This results in rash decisions and violent behavior. His noble journey soon becomes a killing rampage, and his Alpha Squad teammates must find a way to stop him. I'm writing the story in chapters that mimic TV episodes. Similar to light novels, which are popular in Japan, the story is focused on dialogue and action to maintain a quick reading pace. I don't take three minutes of your time to elaborate on a three-second scene. I try to match reading speed with the actual time taking place. Although it's written with older teens in mind, it's a good read for adults as well. If you like action-packed stories with unique characters, comic book movies, RPG video games, anime, and other media, you should read the book ... and let me know what you think!